My boyfriend and I enjoy going out for meals both within our home town and various areas within the UK and if we get the chance to go further afield, it is a bonus. We enjoy meeting up with friends and having a good catch up, as well as trying new foods, to experience new tastes, smells and textures of all the different food from around the world. My boyfriend has once tried a restaurant named 'Wagamama', which is a chain restaurant within the United Kingdom. When he first mentioned it, I must say that I was rather sceptical as I had never heard of this chain restaurant before and for that reason I was reluctant to try this new diner, but how wrong I was to feel this way. This Japanese restaurant offers a range of different types of food to suite many different tastes and peoples ideals of a meal. The menu ranges from sushi to teriyaki chicken and offers many different nutritional information for all needs e.g. gluten free, vegan. The meal that I chose to try was a meal named 'yasai pad- tai', which came under the teriyaki section of the menu. The flavours that came from this dish were just incredible. The egg fried rice noodles were marinated in a tamarind sauce, which even though it was sweet, had a bit of a kick to it. This taste was carefully balanced out with the calm flavour of fried tofu and a range of sweet and delicately flavoured vegetables. I would definitely recommend going to this lively restaurant with friends of even work colleagues. 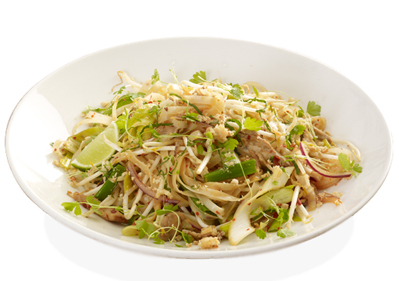 'Wagamama' restaurants are situation all around the UK, so why not try a 'Wagamama' near you. Head to their website to find your nearest store.